The DC Universe streaming service has finally launched, and its first original series, the live action Titans adaptation, is set to premiere its debut episode in just over a week. 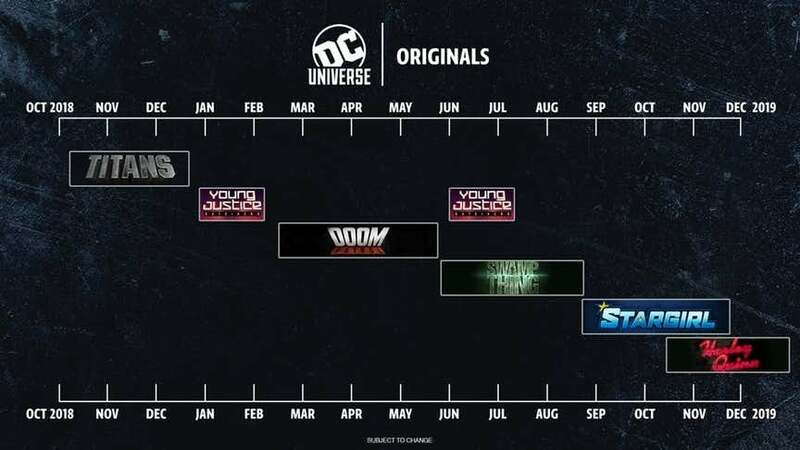 Now that those two milestones have arrived, fans are starting to look ahead at the other originals that are making their way to the service, and DC Universe has finally unveiled a tentative release schedule to let everyone know when they can expect to see these new shows. After the Titans world premiere at New York Comic Con Wednesday night, DC Universe shared a photo of its original release timeline. The image shows a linear calendar spanning from October 2018 to December 2019, and each of the previously announced shows takes up a chunk of the line, revealing when they will air. Take a look below to see when all of the new DC Universe shows are arriving! As you can see, there is both good and bad news to be had here. The bad news is that Titans will be the only original show airing on DC Universe in 2018. It runs from October through the middle of January 2019, with new episodes releasing each week, and no other show starts until Titans is finished. That's it for the bad news! The good news here is that a total of six TV series are being released in 2019, and all of their release dates are staggered. All that to say, there will never be a period of more than a week or two when there isn't a new episode of a DC Universe original series airing. There will consistently be new content all throughout 2019. Young Justice: Outsiders is the first original to arrive after Titans, and it looks as though that show was split into two parts. Part one of the new season will air throughout January and part of February, while part two doesn't debut until June. As far as live-action shows go, Doom Patrol is the next to arrive, though that won't surprise anyone. The series is set to be a spin-off of Titans, and there were some rumors that it would debut before the end of 2018. However, we will have to wait a little longer, as the schedule has it premiering in late February. The Swamp Thing TV series will air from the end of May to the beginning of September, following by Geoff John's Stargirl series, and the animated Harley Quinn show, which debuts in October. One thing worth paying attention to is the fine print at the bottom of the calendar that reads, "Subject to change." Not that DC Universe is planning on moving any of these tentative release dates, but you never know what could happen. Which DC Universe show are you most excited for? Let us know in the comments below! Titans is set to debut its first episode on October 12, and you can read our full review of the series here.